This is not “Fashion Fast Forward: Fashion Fit for Royals”! In my quick read I had assumed that the fashions shown in the image was that of the designer and I saved the post to follow the link, only to find on returning that the image had nothing to do with the label… Which is when I got pissed and chose to follow this up with a personal post. In the end people buy product in this case apparel, apart from what looks like a bait and switch… there is little that is exceptional, authentic or high quality about the designs, (on the right) as seen in screenshot composite! They in fact look like part of an Indian Apparel line that was popular in Brooklyn during the summer (in fact check www.calabar-imports.com) for better prices. Now a label can source its clothing anywhere, it’s their business. However use of the term “Designer” implies you had something to do with creating the look of the garment! Too many “Designers” are doing this. Most however take advantage of skilled makers needed work, and actually commission pieces (often altered from magazines) that too is their business. I do not interfere nor use such designers. This type of press when seen by industry professionals (and often many in our own community), is too often used as an excuse NOT to support African Fashion. That it was AFWNY doing this, why would they risk their brand’s integrity, now i’ll double check each of there stories. I work at creating real opportunities for sale for designers, including Blacks, Africans and Caribbean designers. In many cases I first have to work at building trust and changing the perception of value that the entities I encounter have on what constitutes “Ethnic Design”. There was no statement as per FCC regulations as this being a paid placement so I would assume it was not! 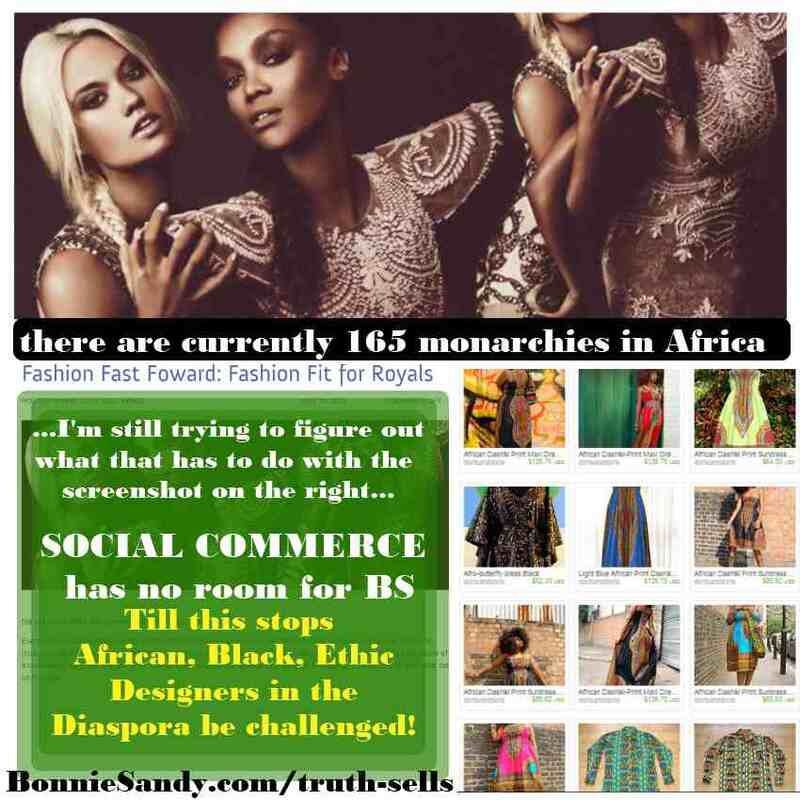 However, I am still trying to figure out what 165 monarchies in Africa has to do with these fashions. Posted in Latest and tagged As I See IT, Selling Styles, Social Commerce, Workshops.